Nellie's Choice - Vintasia Dies "Frame-Doves". This lovely frame and lovebird die is perfect for romantic projects. Used on its own, the frame is so versatile it can be used in almost any project. Size Smallest: 1.75" x 1.25" Largest 4" x 3.5". Stand Alone Dies - Birthdays and celebrations are happening every single day. Balloons are timeless and happy. So "I love you" balloons are extra special! Use the balloons together or separately. This set includes a string and highlight accents. Hand drawn and one of a kind. Approx. size when used all together: 2 1/2" x 1 1/4". Poppy Stamps craft die featuring a circular frame with the word "Love". Memory Box/Poppy Stamps craft dies are made of 100% steel. For use on cardstock, felt, and fabric. Cut, stencil, emboss, create! Use in most leading die cut systems. Craft die featuring whales and hearts. Memory Box/Poppy Stamps craft dies are made of 100% steel. For use on cardstock, felt, and fabric. Cut, stencil, emboss, create! Use in most leading die cut systems. 4 dies included. 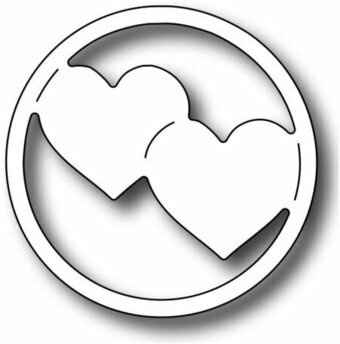 Sue Wilson Dies - Necessities Collection - Baked with Love. This die is a "necessity" if you have someone who loves to bake in your family/friends! 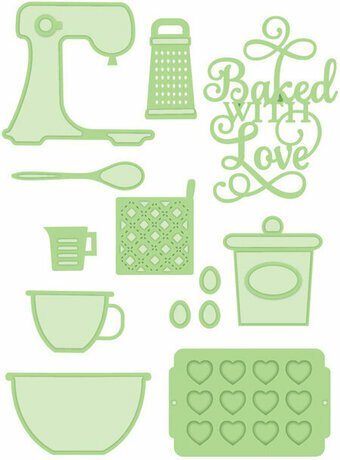 Includes many dies including: mixer, pots, bowls, grater, muffin pan, bowls, eggs and even a sentiment: baked with love. 13 dies. Sizes: Smallest: 0.25" x 0.25", Largest: 1.50" x 2.25". An elegant collection of high quality steel dies designed to coordinate with each other.